No dig gardening was championed by gardener and author Ruth Stout and this method has had variations over the years. From 1953 to 1971, Ruth wrote articles for Organic Gardening magazine, and numerous books on the subject of having "permanent mulch" in her garden. Each year she simply planted her new garden in last year's mulch and added more. How to Have a Green Thumb Without an Aching Back and Gardening Without Work are two of her books that are out of print, but used copies are still available. Ruth was a big proponent of using "spoiled" hay from farmers around her Connecticut home, but she also used any other organic materials she could get her hands on. Australian Esther Deans wrote about her method of layered gardening in the 1970’s and 80’s. Her approach was to have specific layers of different materials starting with layers of newspaper. She wrote several books on the subject including Esther Dean's Gardening Book: Growing Without Digging. In the 1990’s Patricia Lanza developed her system of "Lasagna Gardening." Her system uses layers of various organic materials similar to Esther Dean’s method. Her system is detailed in her book appropriately titled Lasagna Gardening. The major difference between Ruth Stout’s method and those of the other two ladies is that the latter two can start on bare ground, whereas Ruth’s started with gardens that had been plowed for some time. Here at the Crossroads Garden, we decided to try our own experiment with no dig gardening on a small scale. We started with a good layer of wet newspapers and laid them out over existing grass so that there was considerable overlap. The bed we created was the width of the unfolded newspaper sections. To make things less boring we laid them out in a serpentine design, but any design is possible with this method. 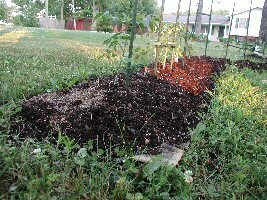 We then added an 8-10 inch mound of fresh grass clippings and covered that with 2-3 inches of commercial potting soil, just because we had that handy. We then watered the whole thing down and let it sit for a week or so to let the grass clippings heat up and start decomposing. We also wanted to let them cool down some because we know how hot grass clippings can get. We then planted our tomatoes using left over plants from our seed starting this spring. 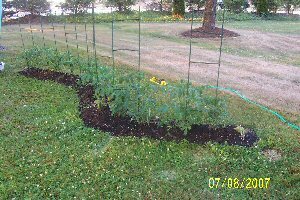 We planted four each of Roma, Better Boy and some mystery heirloom tomatoes that came as an assortment of different varieties in the same packet. 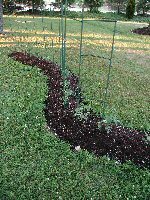 We planted the tomatoes to ½ their height in the mound. They were planted Memorial Day weekend and are just starting to take off. The pictures, taken June 20th, show the location on a grassy area next to the driveway that gets 6-8 hours of sunlight per day mixed in with periods of shade from the trees. We’ll update the pictures later in the season as the plants progress. Whatever style of no dig gardening you think is best for you to use, we think that you will be amazed at how easy and convenient it can be. Our no dig tomato garden tucked in next to the driveway in the front yard. A close up showing the height of the beds. They have settled to about six inches. Notice the newspaper sticking out from the corner of the bed. Updated photo of the no-dig bed. There have been no weeds coming through the beds, so in addition to being no-dig, they are no-weed! The photo was taken July 8th. The white specks in the lawn are clover. Notice the neighbor's grass beyond the garden bed. We have had very little rain in the last month and lawns everywhere that aren't being watered heavily are drying up. Updated photo of the no-dig bed taken August 17th. 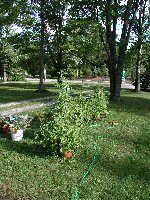 The tomatoes are just starting to ripen and you can see that some of the plants are over 5 feet tall. The beds are still relatively weed free although some of the lawn plants are starting to creep in. These are easily removed, however. After a dry June and July, we have had a lot (over 4") of rain in the last couple of weeks. This rain for the most part was slower rains that were able to soak in rather than run off, so the lawns have greened up nicely.